So, you happen to be a super hero who also shops at thrift stores for capes and loves kittens. The Adventures of Superhero Girl mixes monsters and supernatural happenings with ordinary disasters—like your cape shrinking in the wash! (Hicks, Faith Erin) Faith Erin Hicks is a Canadian writer and artist. She started making comics “for fun” and putting them on the web when she was in college. 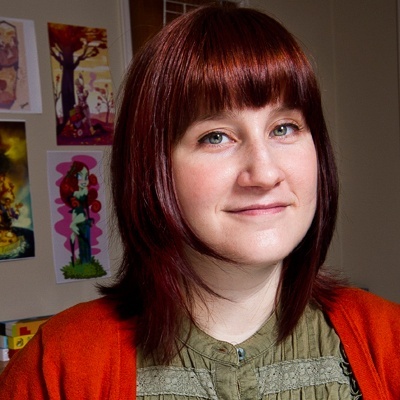 She worked in the animation industry for several years before transitioning into writing and drawing comics full time in 2008. Since then, she has published a number of other graphic novels. 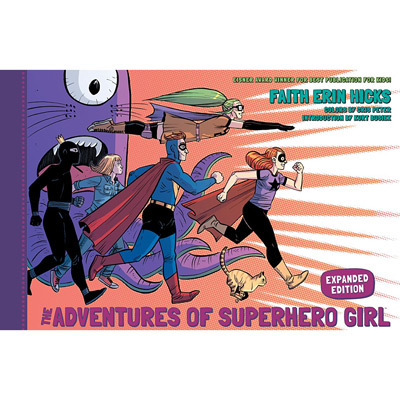 In 2014, Erin Hicks won the Eisner Award for The Adventures of Superhero Girl (Dark Horse Books), which went through four printings and has recently been re-released in an expanded version, featuring two new stories, and new art from creators including Tyler Crook, Ron Chan, Jake Wyatt, Paulina Ganucheau, and more! Publisher’s Weekly writes, “The perfect laugh-filled tonic for heavier angst-filled superhero series."